Genesis Universal Soldier (USA) in 10:38.7 by maTO. 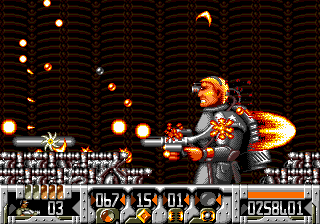 This game is really Turrican II, with the application of a film licence that was picked up late in the development of the port. Think of the gameplay as kind of like Contra with the morph ball ability from the Metroid series and you have an idea of what you'll see here.